Basketball was introduced to Sri Lanka (previously known as Ceylon) in the year 1917 by Walter Cammak, an American who was the director of physical education of the Central YMCA in Colombo. The YMCA took this game to different parts of the country included in its physical training proram. Around the capital cily of colombo the municipality playgrounds and other clubs took up this game rapidly. The first school to introduce basketball was Ananda College in 1927, and later many schools followed suit. 1936 was very significant, as in that year the Japanese and Filipino Olympic teams played in Sri Lanka for the first time. The Second World War brought to Sri Lanka many services teams, which gave further impetus to the game. With increased participation in the game, the need for a strong controlling body was very evident. Consequently in November 1950, the Ceylon Basketball Association was formed with Mr. John Exter, the Governor of the Central Bank, as President, Subsequently the mercantile and public school associations were formed. The Public School Association was instrumental in spreading this game among the student population and in conducting several tournaments. The year 1958 saw the inauguration of the Ceylon Basketball Federation (CBF), which was admitted to the FIBA in 1959. In September of the same year Sri Lanka staged its first international contest against the Pakistan National Team. The first National championship was held in July 1960, and continued annually. Women’s basketball was introduced in 1961. Mini-basketball was introduced in 1967, and several competitions are conducted for boys and girls, annually. The Federation organized its first international competition in December 1964, with India, Iran, Pakistan and Sri Lanka as Participants. The 5th Asian Games held in Bangkok in 1966 saw Sri Lanka taking part for the first time in major international competition. 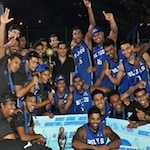 From 1962, Sri Lanka Basketball Federation (SLBF) has been a member of the Asian Basketball Confederation (ABC). Since 1962 Sri Lankans have participated in almost all the competitions organized by the ABC. In 1984 the ABC organized three tournaments and Sri Lanka took part comprehensively in all. The best performance of the country in any international contest was achieved when the youth team (boys) reached the final round at the ABC Youth Championships in Seoul in 1984. Basketball is played throughout the year, with different associations organizing their own tournaments. The federation conducts the national championships for junior and senior (men and women) teams, which are the major tournament highlight of the year.